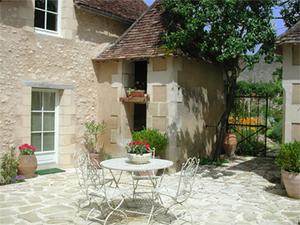 In the center of an ancient village - officially classed "One of the Most Charming Village of France", and designed as a Floral Village - on a quiet little street, upstairs in a peaceful old house with garden and patio, we offer two stylishly decorated en suite rooms. Angles-sur-l'Anglin is surrounded by beautiful countryside, ideally situated near the lakes of th Brenne, the thermal-spa town of la Roche-Posay, cultural and spiritual destinations including the Abbey of Saint Savin (a UNESCO World Heritage site), the Abbey of Fontgombault with its Gregorian chants, the 18th-century farmsteads on the "Ligne Acadienne".The famous FUTUROSCOPE is just 40 kilometers (24 miles) away. In the area there is hiking, horseback riding, swimming, canoeing, kayaking and fishing nearby, as well as a highly rated wall-climbing site. The famous FUTUROSCOPE is just 40 kilometers (24 miles) away. In the area there is golf (7 miles), hiking, horseback riding, swimming, canoeing, kayaking and fishing nearby, as well as a highly rated wall-climbing site.